I have focused my last several weeks on the sampling portion of my project and am loving every minute of it!!! My foremost goal is to analyze how two subterranean sink systems affect the benthic macroinvertebrate communities of Canyon Creek through The Nature Conservancy’s property. 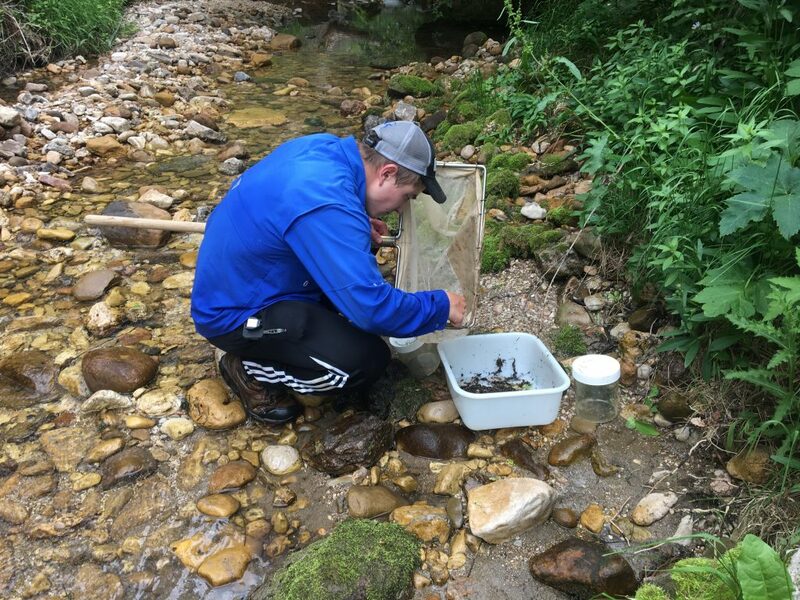 I’ve been sampling invertebrates from 6 unique spots on the stretch of creek, and it’s incredible how different and rich the invertebrate communities are at each spot; likely the result of the unique topography and strong management efforts, respectively. Site 1-just upstream of the upper sink system in a cave of Madison Limestone. After collecting a sample, I sort all of the invertebrates from the detritus and inorganic matter and preserve them in labeled jars of ethanol. Each sample consists of hundreds if not thousands of invertebrates, and extreme care must be taken to ensure the invertebrates are completely intact so they can be accurately identified. The ethanol serves to preserve the invertebrates until I identify them during the 2018 fall semester in an Ecology and Evolutionary Biology laboratory at Yale. The 12 “kick samples” are transferred from the net to a white tub to storage vessels. The sample is then sorted in a less mosquito-concentrated area. One of my most memorable moments at the preserve so far happened just a week after I had arrived. 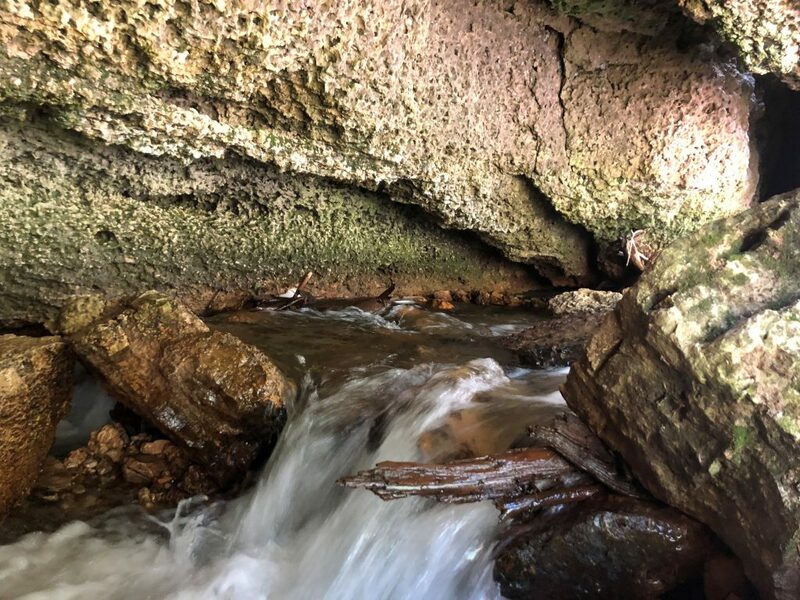 The water was still too high for me to begin sampling, and I decided to explore a 4-mile stretch of river, which included the lower subterranean sink, to flip some rocks and check out the flora. Trey, the manager of the preserve, had previously explained to me that during part of the year, all of the water flows underground for about a mile, but now the water was so high that there was still an ephemeral “surface” creek. Although I could not tell where the ephemeral section ended and water flowed from the ground, I noticed an explosion of caddisflies about a mile from where I started. Caddisflies are closely related to spiders, and they fashion little houses for themselves out of pebbles, wood and other materials, producing silk to glue the pieces together. When I reached a particular section of the creek, rocks which previously had a couple caddisfly “cases” suddenly had fifty or one hundred. I visually marked the location and told Trey that I thought I had found the location of the lower sink terminus. Today, the water was completely flowing subterraneanly, and I went to the downstream side of the sink for the first time with no surface water. I was utterly stunned when I realized the water was surfacing at the exact place I had marked the explosion of caddisflies. It was so cool to have made such a scientific discovery, and I am keeping my eyes open for more subtleties all the time. 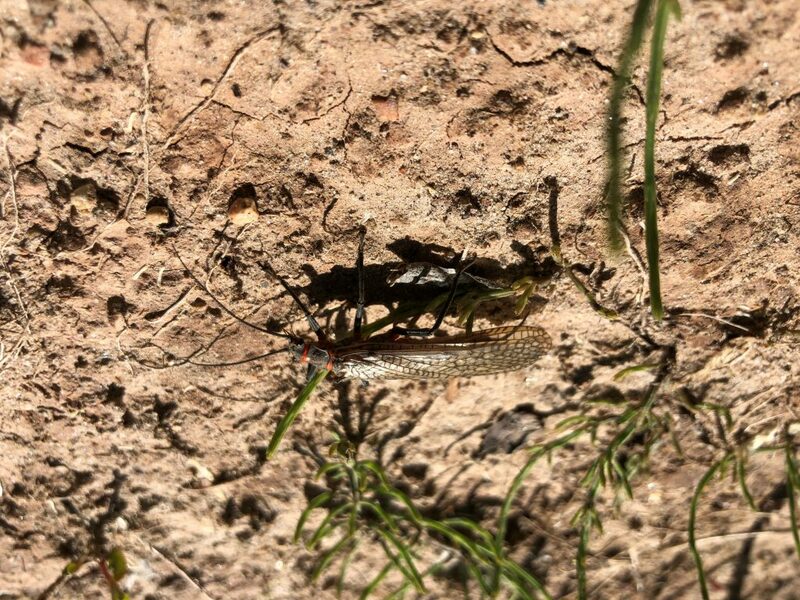 A salmonfly, the charismatic megafauna of the invertebrate world. The scenery is incredible, the fishing is fantastic, and the preserve managers are salt of the Earth. I am so thankful for this opportunity and will continue to learn as much as I can on and off the job for the remainder of my time here. 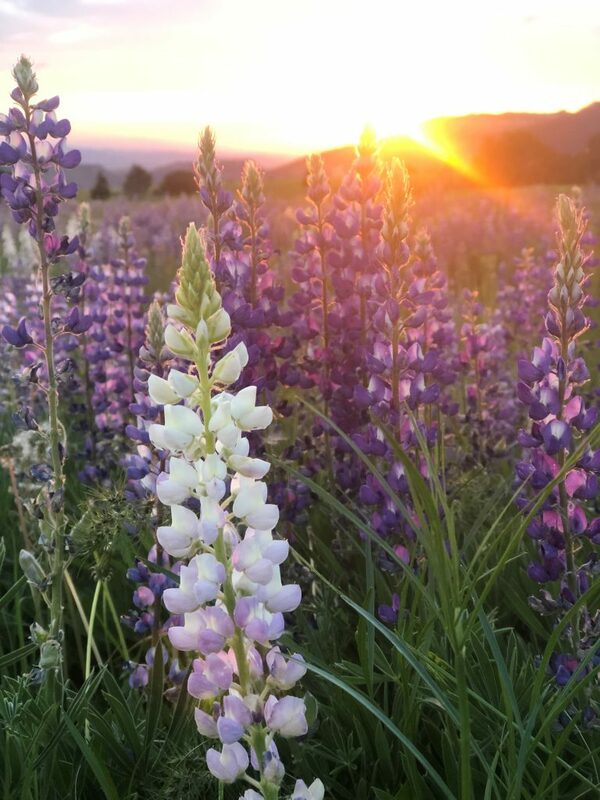 A group of Lupine soaking in the sunset. This entry was posted in Water, Western Research Fellows, Western Resource Fellows, Wildlife, WRF 2018 and tagged Joshua Perez-Cruet. Bookmark the permalink.